This album is a three-CD set. One of the 10 best Classical CDs of 2008. 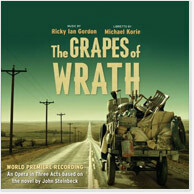 THE GRAPES OF WRATH, John Steinbeck's masterwork, deserves nothing less than the grand possibilities and conventions offered by opera, and Obie Award-winner Ricky Ian Gordon (composer) and Grey Gardens' Tony-nominated Michael Korie (librettist) meet the challenge splendidly in the Minnesota Opera's lauded world premiere opera. Called "nothing short of incandescent" (Variety), THE GRAPES OF WRATH mesmerized critics and audiences with its originality and scope. Having "found the timeless and timely essence of Steinbeck's epic" (LA Times), Gordon and Korie stunningly refashion the truth-telling classic so that it even more powerfully resonates in the hearts of all who search for the American dream. THE GRAPES OF WRATH recreates the nostalgia and harsh reality of the 1930s dustbowl days, tracing the Joad family's journey from the ruin of their Oklahoma farm to the false promise of a better life in California. Performed by a world-class cast including Brian Leehuber, Kelly Kaduce and Deanne Meek, the opera magically combines the sounds of yesteryear with fresh innovative melodies and both profound and simple lyrics to tell an epic tale of love, loss and perseverance. I Keep My Nose Clean; Where's Ya' Headin'? Beg Your Pardon, Ma'am; Nice, Neighborly Place We Found Here; Hooverville? Where's Hooverville? People Again; See Ya' at the Hoedown, Ladies!